If you pay attention to the work of astronomers, you might know that the universe was born from the Big Bang about 13.75 billion years ago, that it’s made of 70 percent dark energy, and that the universe is rapidly expanding and cooling as it ages. What do all of these theories (or facts, depending on your worldview) have in common? It’s humans who have made these scientific discoveries—based on their knowledge, training, expertise, experiences, and the work of others in the profession before them. “If you go beyond the human constructs we’ve given the universe, the universe is actually our own self. We construct, govern, and become the universe, based on our senses, images, thoughts, and perceptions,” said Deepak Chopra, a New York Times bestselling author, renowned spiritual guru and medical advocate. We are living in a golden age of science in which bodies of knowledge are growing by leaps and bounds all the time. Yet, some of the most basic questions about the universe have yet to be solved and Chopra believes it’s because we’re not looking for answers in the right places. 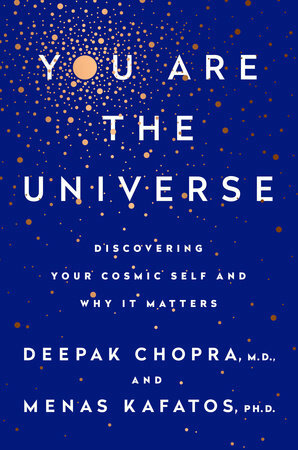 Chopra teamed up with cosmologist Menas Kafatos to explore some of the biggest questions science can’t explain in a book that perhaps could revolutionize the way we think about ourselves, spirituality and the cosmos. But don’t expect a science textbook. At the heart of this book is the idea that consciousness and the cosmos are complimentary, and as we evolve to higher states of consciousness, the universe evolves within us. That affects everything—from our personal relationships, to the environments we find ourselves in, to the business that we do, and the ecosystems that live around us. “At the core of existence there’s only interrelatedness and inseparability. At the core of existence there’s truth, beauty, goodness, and harmony,” Chopra said. Our cosmic significance has perhaps been underestimated. Rather than existing as a tiny specks in the universe, Chopra says that each one of us is a universe and we hold the power to change our reality. That means there are 7 billion universes for the 7 billion people alive on Earth today. In the history of our planet, 108 billion people have come and gone—and their universes birthed and died along with them. There are also crocodile universes, dolphin universes, and even insect universes. It has been said that the universe is chaotic—a sentiment that probably rings true as it relates to the lives of many citizens of Earth at this point in history. Our world seems rife with polarization, fake news, alternative facts, bigotry, hatred, racism, and many other modes of marginalization. Chopra believes that if you want to change the world, we must first get in touch with our innermost beings—which extends beyond our bodies and minds. Although the central ideas of the book may seem separate from organized religion at first glance, they form the foundations of our religious experiences. The book is a synthesis of the beliefs and ideas held by the world’s religious founders and some of the most renowned philosophers that have existed in humankind, Chopra said. Chopra says that if we look at the experiences of the founders of organized religions, we will find three elements common in their spiritual journeys: transcendence—becoming at one with the universe; the emergence of platonic values—such as compassion, joy, and love; and the loss of the fear of death. “God is just an name for the inevitable, infinite consciousness that us actually part of all of us,” he said. Ultimately, Chopra hopes that this book will create dialogue between science and spirituality. He encourages anyone who aspires to grow in their understanding of their place in the world and how our universes are created to visit the website and the “Ask the Authors” discussion forums available to support the book and the broader conversation around consciousness at www.discoveringyourcosmicself.com.